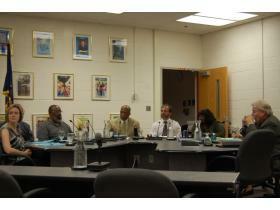 The Ypsilanti Board of Education met Monday night and approved the hiring of Aaron Rose for West Middle School assistant principal. Rose is a YPS alum and has worked in the district for nine years. Aug. 11, 2009 · 12:07 p.m. The Ypsilanti Board of Education unanimously approved the hiring Aaron Rose Monday night to serve as the new West Middle School assistant principal. Rose, who has worked for the district for nine years, taught math at East Middle School last year. He previously taught third, fourth and fifth grades at Adams Math and Science Academy while also serving as the head teacher and substitute principal. Not only has Rose served as a teacher in the district, he’s also an Ypsilanti alum. “I’m extremely excited to be working in the district I graduated from,” Rose said. According to a memo sent by John Fulton, YPS human resources director, Rose was highly recommended by the interviewing committee, which included Superintendent James Hawkins and two teachers from West Middle School. Fulton spoke highly of Rose’s eight years spent working at Adams Academy, highlighting some of the work he did while that school’s principal was out on leave. “Aaron did a superior job of running the building in her absence,” Fulton said. Rose received his bachelor’s degree in 2000 and master’s degree in educational administration in 2005, both from Eastern Michigan University. He has also attended the Washtenaw County Administrator’s Academy. In addition to hiring a new assistant principal, the board also approved an easement requested by the Ypsilanti Community Utilities Authority near the southeast corner of East Middle School at Tyler and Emerick streets. According to documentation, YCUA intends to install a sanitary sewer and pump station near the school and will pay $5,000 to YPS for use of the land. YCUA is forbidden from leasing the space to other utility companies and will be the only entity allowed install hardware at the location.